I do not know a lot of about English witch trials, but it seems Pendle Hill is really famous because they executed so many. So some things in this story are true, while other things are unknown so why not weave a story around it. Fleetwood is the mistress of Shuttleworth. She is expecting her 4th child, and none of the previous ones have survived. And this pregnancy is making her ill. She was curious, she liked being outdoors, and some thought she should sit inside all day doing womanly things. But then being married was much better than staying under her mother's roof. And Fleetwood sure grows in this book. She will do anything to bear this child. To be a woman in 1612, ugh, no thank you. Not to mention that they were hunting witches so women who actually knew things were getting killed. Witchtrials were such BS. Women who were strange, women who were disliked, some woman who had looked at you the wrong way. Someone who you disliked for no reason at all. Sure, accuse them of witchcraft and see them burn. People are idiots. And Fleetwood gets caught up in all of it when her midwife is accused of witchcraft. But she shows true spirit then. She will let her voice be heard. Her husband, well something comes up and I was so unsure what to think. But he does love her, and well this is not a romance. Roger, grrr, ok so you do not know who Roger is, but that thing at the end, fu Roger, FU! To save her child, she will trust a stranger. To protect her secret, she must risk her life. Young Fleetwood Shuttleworth is with child again. As the mistress of Gawthorpe Hall, she is anxious to provide her husband with an heir. But none of her previous pregnancies have come to term. Then she discovers a hidden letter from her physician that warns her husband that she will not survive another pregnancy. Distraught over the frightening revelation, Fleetwood wanders the woods of Pendle Hill, where she comes across a young local woman named Alice Gray who is gathering herbs. A midwife, Alice promises Fleetwood she can help her deliver a healthy baby. But soon Alice is drawn into the frenzied accusations of witchcraft sweeping the countryside. Even the woodland creatures, the familiars, are suspected of practicing the dark arts. Can Fleetwood trust that Alice is really who she says she is? As the two women's lives become intertwined, Fleetwood must risk everything to prove Alice's innocence in order to save her own unborn child. The hunt for witches reaches fever pitch. Time is running out. The trials are about to begin. Both their lives are at stake. Only they know the truth. Only they can save each other. 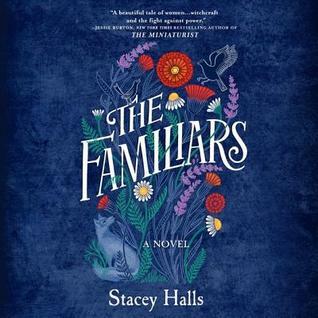 Set against the dramatic backdrop of the real Pendle Witch Trials of 1612, this rich and compelling novel draws its characters from historical figures as it explores the lives and rights of seventeenth-century women, ultimately raising the question of whether witch-hunting is really just women-hunting. This sounds interesting especially since it's about the witch trials. And lol when they make kids creepy, it's terrifying. I heard very little about this book but it sounds very good and I love historical fiction. Never heard of Pendle Hill, will now have to look this up. Oh I hate those witch trials, so criminal. People are certainly idiots and much more. Creepy kids - evil! Can you imagine what the witch trials would have been like with social media??? Yeah, I agree, I wouldn't want to live in the 1600s either. Poor Fleetwood, that letter she found from the doctor to her husband, yikes.